The Gang Enforcement Training Center was created to educate, mentor & support today’s Gang Enforcement Professionals. The Gang Enforcement Training Center helps students advance their expertise and careers in the areas of gang enforcement, extremism, biker gangs, prison gangs, hate groups, domestic and international terrorism, intelligence and much more at the international, national and local levels. Our students benefit not only from our cadre of subject matter experts, but also from the many professional network activities we organize in order to enhance each officer's training experience. We are well into the digital age, and the old way of learning doesn’t cut it in today’s workforce. Agencies are being introduced to a more modern and mobile-friendly training environment, but are unsure how to translate the digital age into reality based practice. That's where we come in. We take all the guesswork out of who, where, and how to train today's force for tomorrow. Get your training from today's leading subject matter experts in Law Enforcement, Corrections, Juvenile Justice, Open Source Intelligence and Much More. The new Gang Enforcement Training Center's approach is to deliver threat related training that reaches well beyond the focus on "gangs." Our mission is simple; to deliver valuable knowledge to those charged with public safety at all levels and disciplines. The below topics are just a snapshot of the areas of expertise that our instructors have and we are actively searching for new topics daily. and topics we haven't even thought of yet. Exam Guarantee: Pass it or try again on us! Keep Sake: Diploma, Padded Cover, Transcripts. 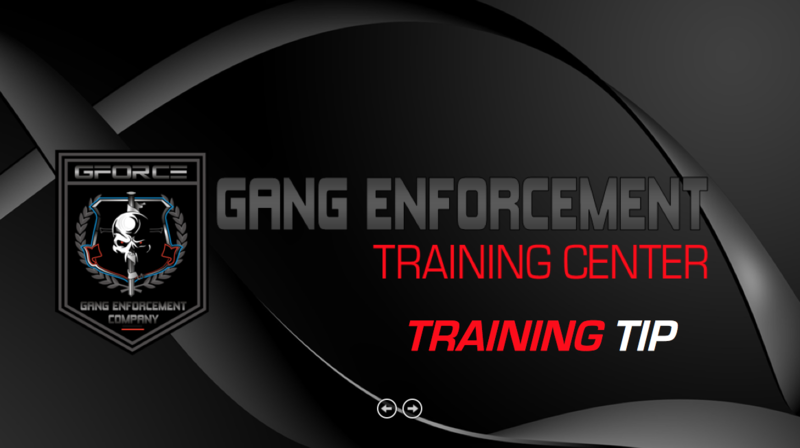 As a resource to members of Gang Enforcement Black | All Access, the Gang Enforcement Training Center sends out weekly training tips accessible in the field as a way to both develop a foundation of gang knowledge as well as build upon that foundation towards a greater level of expertise. Below are just a couple of samples of those weekly training tips.